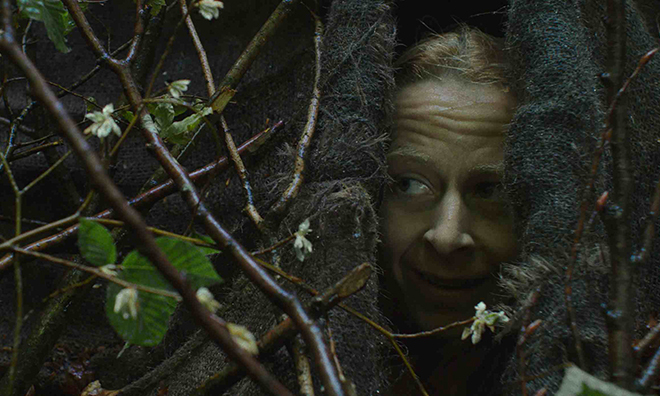 Less is certainly more in Tom Geens’ sophomore feature Couple in a Hole. A Scottish couple go native in the French countryside as they grieve a great loss by living off the land. The Belgian director – who made London his home 23 years ago – sat down to chat with CineVue’s Matt Anderson about a five year long creative process, getting back to basics, chasing rabbits, broken legs and dealing with Pyrenean weather. All in a day’s work. Matt Anderson: Where did the idea for the film’s story come from and how did it evolve? Tom Geens: The original idea was a juxtaposition between order and disorder and that the animal inside us is never far away. It came from the image of a middle class couple in their normal attire, dishevelled, but surviving in this hole. A lot of my work is about how we can all revert to act in a primal way. Like you see now with the refugee crisis – you see people behaving appallingly. MA: And you think that animal is within everyone at some level…? TG: I think so. I think the abstraction of civilisation, of retreating from everything that is earthy, or dirty, and trying to cancel it out is almost unnatural. We still cannot accept dealing with death and decay on an emotional level and researching that is what interests me. MA: What has happened before we join the film is crucial and revealed painfully slowly. How did the narrative structure take form? TG: For me it was a very gradual process. The biggest challenge was to create this world as completely believable; that these two normal people would survive in a hole and that there would be something that keeps them there. Keeping this credibility was a challenge because it is immersive cinema; you are asking a lot of the audience, to jump in and really accept this world but then also to puzzle it together. Every year since 2009 we felt ready to shoot but the money wasn’t there. This forced me to go back to the script; it was almost like some five year torture process. Making it very simple was another challenge. The story has to rely upon four characters, a forest, a hole and a village, so there are very few elements to hide behind. In a way I needed a lot of time to get that right, gestate and mature. MA: A great deal is communicated through very little. As both writer and director was showing such restraint difficult? TG: Part of the challenge I set myself was to try to communicate with as few elements as possible and dialogue was one of them, definitely. I tried to make the dialogue more and more condensed. Unless you are Tarantino with a Pulp Fiction where dialogue becomes a feature of the film, for me it’s more about the atmosphere and building a world. MA: The ‘franglais’ balance of the script works very well. How did you come to strike that right note? TG: It was tricky because it was another thing that had to be totally credible in order for it work. We were conscious of finding a rhythm there. Jérôme Kircher’s English actually became better as the shoot progressed so it became a problem! It was a real concern and something we worked on to get the right balance. It’s not something you can write down – it’s something you work on when you’re there working with the actor. MA: Why did you choose for the central couple to be Scottish expats living in France? TG: You’ll probably love this but a big part of the inspiration for the whole thing was [TV show] A Place in the Sun! I think just to have this foreign element, these people stuck in a foreign territory was important to me. MA: How did the casting of Paul Higgins and Kate Dickie come about? TG: I did a test film in 2012 so we started casting then. After a while you realise you’re not trying to change anyone, you’re basically waiting for the character to walk in and that happened with Paul and Kate. I had a strong feeling with both of them that they understood what was required, they took the part and that they were going to go for it because you can’t just get in and go “Oh no, I can’t do that.” You have to be totally up for it. MA: Did you spend night’s sleeping out rough? What was the preparation for the shoot? TG: They did go on a six-week diet that was prescribed. But then Paul broke his leg! We worked five years to get the project off the ground and four days into the shoot he breaks his leg and the next day we were back in London, all devastated. Otherwise, we didn’t really prep mentally massively for the parts. I think it’s a lot to do with imagination, you don’t have to go out and kill someone to play a gangster in a film. I think being in nature, being part of the Pyrenees, part of the real roughness and brutality of that place – rain, snow and wind all in one hour – forces you into giving up and going for it because there’s no respite. There’s no time to think, do I really want to be here? You just have to do it. MA: How did you come to the decision of the Pyrenees as a location? TG: It wasn’t in my script from the start. In fact the script went through quite a few changes of location: first it was set in Corsica, then Eastern Europe because there you have vast forests where you could just totally disappear. Then the money came in from the Midi-Pyrenees. I started thinking that this area could be a lot more interesting, it’s a wilderness on your doorstep. It brought the original dynamic, of civilisation and nature, out even stronger, I felt. MA: Such conditions must have been a real challenge but what were the real plus points from shooting out in that environment? TG: For me they are all benefits. The environment forces you to go beyond what you were expecting. Everything you’re doing becomes very natural somehow because it distracts. You have to make decisions quickly so you just go with your gut. The whole bit with the rabbit at the start, it just wasn’t working. So I came up with the idea of just letting him chase it and the scene became alive. It’s stuff like that really tests you, challenges you. You can’t be rigid, you have to be flexible and adaptive. Somehow I think the breaking the leg thing has added more diversity to the look because suddenly you come from March where it was all dark and dirty, to June where it’s beautiful greens. It added a time span and a richness of texture to the whole film. MA: What the couple are hoping to achieve from living in this way is left quite ambiguous. Why do they revert to living in a hovel in this primal state? TG: I think it is the simplicity. I could have easily hidden this couple in suburbia and they would’ve just stayed in their house. She might’ve locked herself in a room. It’s first of all a hiding place but secondly the simplicity of everything around them and where they return to. There’s something very soothing about the simplicity of nature. Tasks reverted to very traditional role patterns which saw her taking care of the hole and he going out foraging. It’s a kind of distraction from their big elephant in the room, in the forest. Its basically about going back to survival. MA: As the film progresses the score shifts from sounds of nature to music – how was that transition made and who composed the soundtrack? TG: In the beginning I really wanted this to be a re-enactment of the Adam and Eve story – a fantasy-driven place. I went with ‘let’s just celebrate nature’ so it was full of birds, it was like being in some kind of aviary. And it killed the film. So we started stripping all the birds out and I realised that it was about a contemplation of nature, not a celebration. For the music I had a composer but then listened to BEAK – Geoff Barrow’s band – and it was totally right. All these discordant sounds somehow work together and are very much in spirit with the film because everything grates. I deliberately played with genre and changed it and I wanted to continue that till the end. It created a lot of debate and I like that; ultimately that’s what you want, a film that makes people think. Couple in a Hole is in UK cinemas on Friday 8 April. Read our review here.